Ernest Jean Joseph Godfrinon was a Belgian painter of still lives, landscapes, interiors and flower pieces in the Impressionist style. He was born in Brussels in 1878 and went to the Akademie voor Beeldende Kunst (Academy of Fine Arts) in Ixelles and Brussels. 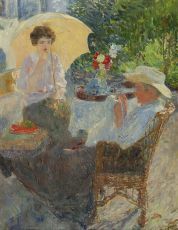 He was active as a painter from 1898 until his death in 1927. He was a member of the artist association Le Sillon, which was founded in... Read moreErnest Jean Joseph Godfrinon was a Belgian painter of still lives, landscapes, interiors and flower pieces in the Impressionist style. He was born in Brussels in 1878 and went to the Akademie voor Beeldende Kunst (Academy of Fine Arts) in Ixelles and Brussels. 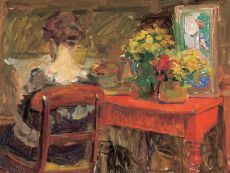 He was active as a painter from 1898 until his death in 1927. He was a member of the artist association Le Sillon, which was founded in 1893 as a counterweight for Neo-Impressionism and Symbolism. Godfrinon’s work is to be found in the Charlier Museum in Brussels.